TORONTO—A choir with heart needs a conductor with heart, and this is what the Toronto Jewish Folk Choir got when it signed up Ukrainian-born conductor Alexander Veprinsky. The accomplished musician joined the choir 10 years ago, and has since devoted himself to keeping alive the Yiddish language and music treasured by the Jewish community. 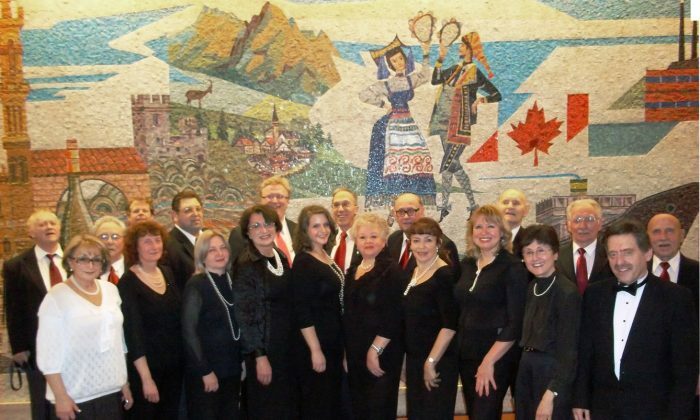 The choir’s 87th anniversary concert on June 2 will feature the musical variety that characterizes it, from Yiddish folk songs and popular tunes, to classical songs such as Mendelssohn’s “He Watching Over Israel” as well as operatic pieces. The choir is also honouring legendary Yiddish theatre writer/composer Avrom Goldfaden (1840-1908) and the renowned Canadian composer John Weinzweig (1913-2006). “It’s a variety of programs, which are connected in different ways to the Jewish culture. It works for any taste, but it’s all connected by the Jewish theme,” says Veprinsky. When choosing the repertoire, the conductor consults with the choir and the audience, but ultimately his criteria is to present good music in terms of both melody and musical arrangement, he notes. An accomplished musical arranger and composer, Veprinsky has arranged many pieces for the choir throughout his tenure. To him, musical arrangement is the key to presenting a song in a professional manner and to developing it to its potential. “The melody is a seed, and we have to grow the whole thing from the seed,” he says, noting the importance of musical elements such as harmony, accompaniment, and timbre. Veprinsky’s wish is to bring Yiddish songs to a professional level and perform them with all their colour and depth. “It’s the same as when you have a product with a bad wrapper—it’s not good. You have to present this product,” he says. Veprinsky says that while the choir features predominantly Jewish members and audiences, it attracts people from different backgrounds, brought together by a love of Jewish music. Preserving Yiddish language is part of the choir’s mission. Veprinsky believes this language is very important as a tool of communication between Jewish people of different backgrounds. “Not many people know Hebrew outside of Israel—that’s why Yiddish is the international language connecting Jewish people in many different countries. Many people around the world know Yiddish,” he says. Veprinsky admits that it is not easy to attract new members and audiences, adding that this is a struggle felt by many choirs. Making music as a choir requires a lot of hard work, he says, and it is not something that is appealing to everyone. However, he believes that the hard work pays off when choir members see the audience’s enjoyment.